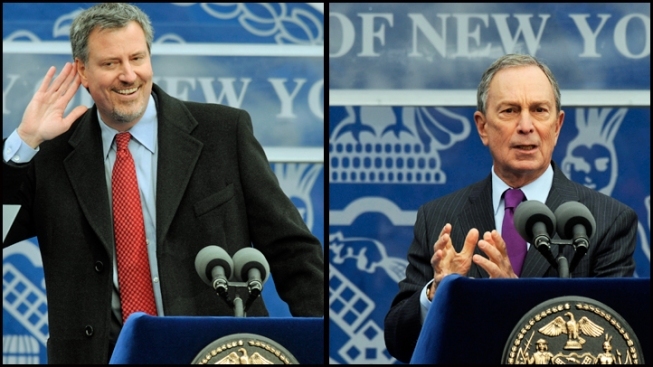 Bill de Blasio, left, and Michael Bloomberg, right, are shown at the same lectern on Inauguration Day in 2010. De Blasio is about 10 inches taller. City Hall offices may need new furniture when Mayor-elect Bill de Blasio takes over from Mayor Bloomberg, who stands 10 inches shorter than him. De Blasio, at 6 feet 5 inches, will be New York City's tallest mayor in recent memory. Ed Koch was said to be taller than 6 feet, Rudy Giuliani and David Dinkins were of average height, and Bloomberg once referred to himself as 5-foot-7. Bloomberg infamously listed his height as 5-foot-10 on his drivers license, but he was not the shortest mayor by far. Fiorello LaGuardia and Abe Beame were both 5-foot-2.